One for the Yearbook and one for Fun. Track Time: Make the Move - XC is over - switch to Track. All-NorCal XC Teams: CCS does quite well with Abdalla, Hunt, MacQuitty & Barnett all being the best for their grade. 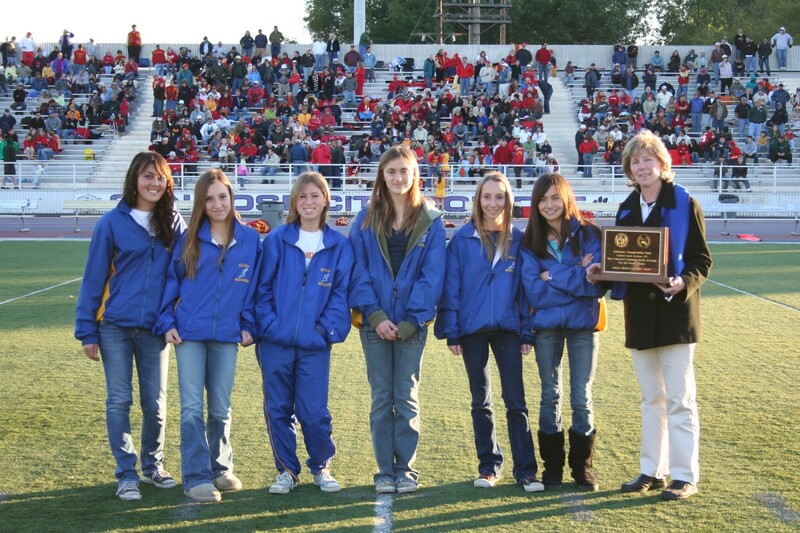 Gilroy Girls win CCS-XC GPA award: Kristina Schmidt, Anne Donahue, Brandie Rodriguez, Christine Bobula, Kathleen Miller, Paty Hernandez and Coach Cathy Silva (not pictured: Megan Litle). The Christmas Song: It should be a yearly tradition - quite a laugh (if you're an animal rights activist you might want to just skip this song). Xmas Light Show: at Christmas time some people have WAY too much free time on their hands but it's a fun 3:20 video of what you can do with a house. Funny Cats: Are you bored yet because XC is over and track hasn't started? Sit back and laugh. Mohamed Abdalla (Willow Glen): Is also Athlete Of the Week. Mohamed Abdalla (Willow Glen): Is a State Champ. Turkey Trot: Thanksgiving Turkey Trot at Crystal Springs-Parker Kelly (Serra '87) wins with a 16:25 and Jacquie Cooke (Burlingame '94) takes the ladies with a 17:19. Hayley Pascale (Carlmont) warms up for States with a 18:21. Marcos Corona (Willow Glen): Lot's of hard work pays off. Shannon McVannel (Salinas): gets coverage from the Monterey Herald and will be running for Chico next year. CCS Times Vs League: Comparison of CCS Toro times to League Crystal times - thanks Walt. Proper Place Settings: Want to impress your folks the day before you head off to States? Now you can show them the correct way to set a table for Thanksgiving dinner. SCVAL XC Post Meeting: The SCVAL post meeting will be held at Wilcox HS at 4:00 on 11/27. Send Walt any items you want to discuss. Carlmont Surh Brothers: get some nice local press coverage. Lynbrook XC/Track Alums: Another XC/Track reunion. This time on Nov 24th, 12:00 at Le Boulanger in El Paseo. Athletes Of the Week: Matthew Petrillo (Los Gatos) and Sammy Hamilton (HMB) are Mercury's Athletes of the Week. Saratoga News: Covers the CCS Finals. Coaches Clinic: On Dec 7th at the Holiday Inn at Fisherman's Wharf, the Asics Aggies are hosting a Coaches Clinic (this is the Thur before the XC Nationals at GGP). CCS Finals: Both guys & gals were ranked 12th going into the meet and they both finished 10th. Jason Wang and MayC Huang led the Vikes with special kudos going to Gene Burinskiy & Nishi Waghray who had phenominal races. Crazy Cat Trick: You have to see this to believe it. Don't let your cat try this at home (maybe one of your runners though). Saratoga News: Covers the DAL League Finals. Hawaiian Pledge: A pledge to shave their heads if they qualified for CCS - and a Mile Time Trial to check out the aerodynamics of the new 'do. More State Track Videos: I now have the 1989 State Track Meet, the 1990 State Track Meet and the 1994 State Track Meet videos online - more to follow. Carlmont Common Bond: SJMN covers the Carlmont Boys XC team and those runners that have 'dipped' at the Crystal Springs course this year. 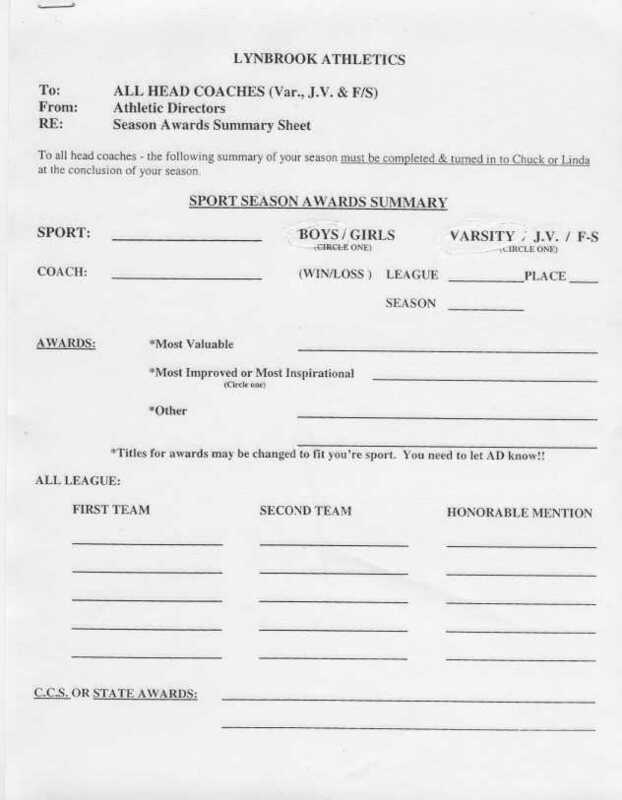 Crystal Springs All-Time list: Has been updated and for 2006 we added Abdalla & Petrillo for VB, Fedronic for VG, Los Gatos girls team (#3 All time) and Carlmont girls teams (twice). I've also updated the 2nd Generation list - if there are any additional 2nd generation teams out there, let me know. DAL Finals: For the first time in 10 years, the Lynbrook Vikes are sending BOTH a guys and gals team to CCS. Jason Wang & MayC Huang led the way for the Vikes. Happy Halloween: Be prepared for the unknown and always laugh at the unexpected (click link on the left). 1986 State Track Videos: More great stuff. This time headlined by the Mastalir brothers (Jesuit) and Fitzsimmons (SI) & Mack (SF) in the 800/400 for CCS. FUHSD Championships: Homestead had a short lived victory in the Varsity Boys race until a missing runner was identified as Monta Vista and the Matadores won again (5 in a row I think). Signore & Huang continued their #1 ways for the Vikes as we all get ready for League Finals Week. A GOLD MINE discovered! : Yes it's still XC season but thanks to Andrew Hecker, a trove of State Meet Track videos have been found and are in the process of being converted to WMV files and being posted. The first batch (1995 State Meet) is up and more getting added as I receive them. Be sure to watch the boys 1600 with Michael Stember (Jesuit) unleashing a 1:24 last 600 - unbelievable. Stephanie Bernett (Leland): Gets the honor of being the Mercury News Athlete of the Week. How NOT to win a marathon: He just ran 2:07 and change and this happens. He won Boston and was going to defend his title, now he's advised to take 3 months off from running. Direct Athletics Results: Ever wonder how to get results from Direct Athletics - here's how. With the Cristal Springs Center meet, Serra Invite, Stanford and others it can be a bit confusing do this explains all. PAUSATF Shoreline XC Meet: The USATF XC Nationals are coming to SF this December and the local teams and runners are warming up for it with the Shoreline XC Meet. Deer Attack on XC Runner: And who said XC isn't a dangerous sport - just ask this 7th grader as he warms up for his race. Click on the SLIDE SHOW link. Murdock Park Workout: Vikes run some repeat 1200's - breakdown style. Gerry Lindgren: Some more fun 'old' stuff - ever wonder what Lindgren did for training in HS to get as fast as he did? Check it out. Jim Ryun-1964: So this is what happens when I go through my old (OK, real old) binders of articles. Thought I'd share this with everyone. Annual Rallye Run: The team of Anna, Lauren, Jamie, Yvanna, Nandy & Mitha beat the guys of Brandon, Archit, Andrew & Bryan by a score of 31 to 26 (perfect score was a 39). Crystal Springs Invite: Everyone knows about Abdalla's #9 Junior time on the Crystal Springs course but did you know at the same meet Stephanie Barnett (Leland) ran the tied for 8th best time (17:52) as a Soph - and that the Carlmont Girls Team Time is now ranked #12 on the All-Time Team List? Click here to see all the Crystal Springs Records. Monterey Invite: Saw the ladies come home with a 3rd place finish and a hard earned trophy. Lots of people 'stepped it up' today making it tough for the coach (me) to decide who will run Varsity at Leagues. Taylor Johnson (SLV): Merc comes through with a great article on Taylor Johnson. Jeneba Tarmoh (MP): Will be running for Tennessee. New XC Invite for 2007: Coaches - The Lynbrook Invite will be held on the new Homestead XC course. The URL (left) shows you a course map and description of the course. This will be a trial run for this new course at Homestead HS. If all works out well, expect a new XC Invite to be held on this course next year (2007). Do you, as coaches, have any dates where you think an XC invite, that can accomodate 30-40 teams, would be a good choice? We're looking for a Saturday race date. Please look at your schedules and email me you 1st, 2nd & 3rd choice of dates where you would consider coming to this new Invite. Stanford Invite: Welcome to the Big Leagues. Stanford opened the eyes of many young Lynbrook runners and they responded fantastically. Amrit Subramanian and Michelle Yee (both freshman) were moved up to Varsity and they place as 4th & 3rd persons, respectively - way to go! Next meet is everyones first look at Crystal Springs for the year. Lowell Invite Course Distance: Per this email from Andy Leong... Went over the course change on Thursday. From the point of change (where the dirt service road meets Kennedy Drive, #9 on the F/S map & #3 on The Varsity Map) to the regular finish line in Lindley Meadow is .23 miles. From that same point to the finish line used on Saturday is .36 miles. Therefore the additional distance is .13 making the F/S course 2.13 miles and the Varsity/JV course 2.93 miles. Jack Welch (Redwood): Passes on after a long struggle from injuries sustained in a car accident two+ years ago. One tough record! : And you thought XC was a tough sport - try breaking this record. Central Park Invite: Deciding to rest the Varsity since they just got back from Hawaii (and Stanford is on the horizon) the Vikes had only a scattered Varsity showing. Michelle Yee continues to show improvement and will move up to Varsity on Saturday along with fellow frosh Amrit Subramanian. Iolani Invite: Follow the Lynbrook XC team as they venture to race in Hawaii. Saratoga Scrimmage: JV Girls continue their tear with 5 in the Top 15 - Michelle Yee second overall. F/S & JVB also garner some Top 15 spots while the Varsity is off in Hawaii gettining ready for the Iolani Invite. Coaches Clinic: Is happening in Palo Alto on Stanford weekend (Fri night). Firebird Invite: F/S Boys score a 2nd while JVG & JVB both snag 3rds. VG take 7th and VB take 9th out of 18 teams. Matt Petrillo (Los Gatos): Gets some nice press from the Mercury. No Reno Indoor Meets: Got word from Al Hernandez that Reno will NOT be hosting any indoor meets this track season. The PV Summit will continue thru the USATF. SCVAL Pre-season minutes: SCVAL coaches: If you were not at the meeting or can't remember what your job responsibility for the League Meet is, check it all out here. Lynbrook Center Meet: The Varsity squads have a tough time starting off the season but the F/S Boys, JV Boys & JV Girls (thanks to our 6th runner Nishi Waghray) all come away with wins. Frosh Luca Signore (11:36.6) has the fastest guys time of the day while senior MayC Huang (13:40.6) leads the ladies. Runners' Bond: San Jose Mercury news has a nice article on the Willow Glen runners (Abdalla & Corona). Crystal Springs: Meet Schedule. Tells you what meets are to be held at Crystal this year. Updated Aug 28. Animal Thieves: Another funny one. Don't you just hate it when this happens to you? Jr Oly, Reg 14 BESTS: A great list put together by Keith Conning of the JO's and summer track running. 1956 Calif State Meet video: Another gem has been discovered. If you missed it back then, there is now an 18:47 video of the HS State Meet with both Track AND Field events. SCVAL Pre-Season Meeting: Will be held on Sept 5th (Tue) at 5:00 at Wilcox HS Faculty Lounge. Artichoke still alive! : The popular Invite scheduled for Oct 7th still might happen. Lots of folks have gotten involved to see if a work-around is possible. KO will still do Meet Management - it's just a matter of being flexible and working with all parties at the school. Bummer News... Keep checking the link to the left for updated info (update:08/15, evening). CANCELLED. 14-day Cycle Training: While going through old running plans I always find one that I liked and wanted to share with others. Creek Run Video: Make sure you know how wide the creek is before you try and jump it. LG All Comer: Weekly RESULTS (08/10) from the All Comer meets (thru 08/10), starting June 22nd thru Aug 10th. Tim Krieger (Monta Vista) resigns: Monta Vista (girls ranked #2 in pre-season CCS poll) looses their XC coach. Vashisht Madabhushi: runs 601 miles, a new school record for most miles covered in 60 consecutive days over the summer. Click here for Lynbrook list. Final Gilroy All Comer: will be UNDER THE LIGHTS! Weekly RESULTS (08/05) from the All Comer meets (thru 07/22), starting July 15th thru Aug 5th (3 total). Andy Anderson: Long time USATF Starter/Official dies of a heart attack. This Day In Athletics: Something cool. You can see what TRACK thing happened today or any day you plug in. Update #2: Lynbrook runners - get on the roads so you can get in shape. Half Marathon Training: Julia Widstrand (Los Altos coach) is training folks for the Half Marathon- contact her if interested. Altitude XC Camp: Julia Widstrand (Los Altos coach) still has some openings for her altitude (8000) training camp. She's extending the deadline until July 14 (or until she's filled). 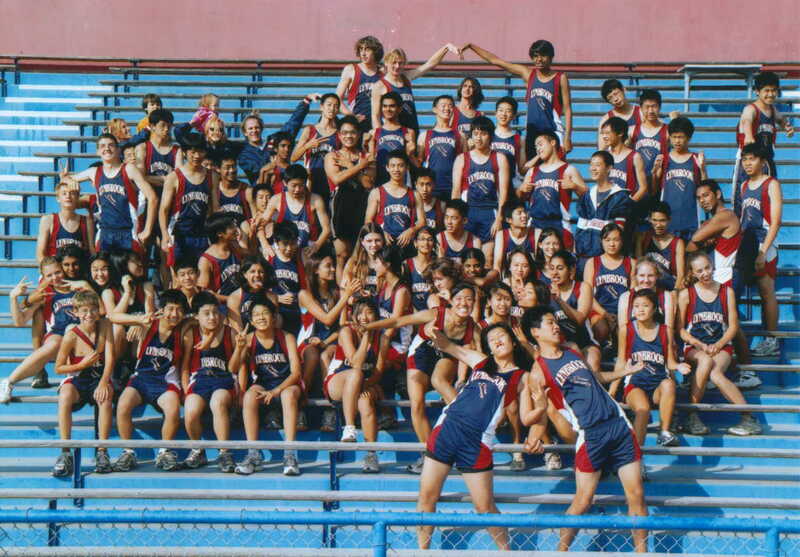 CCS All Time Top 100: OK - so now I'm done with track - bring on XC! Gilroy HS: Is holding some All-Comer Meets this summer - check 'em out. Crazy Cats: Time for a little laugh - to the music of 'All Star'. Toro All-Time List: Coaches: Coach Ibarra (NMC) is putting together the TEAM All-Time list for Toro - please contact him with any updates. Pre-Season Checklist: Lynbrook XC Runners - if you're coming out for the team, print off the checklist and take care of business BEFORE school starts. Open Space Application: Coaches: If you plan on running your teams at either Rancho San Antonio or Fremont Older, beware. You need to have a permit or you may be cited. Print off attached application and FAX in - there is NO COST for the permit. NEW SERVER: LynbrookSports.com has switched over to a NEW SERVER. If you find that a link no longer works, please email me at HANKLAW@IX.NETCOM.COM and tell me what you were doing so I can fix it. RFP for XC State Meet: Will 2006 be the last year that the XC State Meet is at Woodard Park? With cost going from $0 to $17,000+ it would appear Fresno is pricing itself out of the meet. Any Section want to bid on the Meet - the Request For Proposal can be found to the left. CPR Class: FUHSD Coaches - do you need to renew your CPR and/or First Aide? Click to the left for the class times. Coach Mike Dudley: continues his support of distance running with his annual cross-country camp, open to anyone who wants to join. LynbrookSports moving to a new server: Folks - due to space limitations and band width useage I will be moving all of LynbrookSports data (history and all) to a new server. The switch over will occur sometime during the next 2 weeks. Any links you have to the old Lynbrook server will no longer work after July 1st. If a link doesn't work, please email me at Hank Lawson and let me know what sport, year, and URL that is broken - so I can fix it. You should also try the following: replace --> www.lhs.fuhsd.org --> with --> www.dyestatcal.com and the URL will then work. 300/500 Mile Club: You can start anytime between now and June 30th. 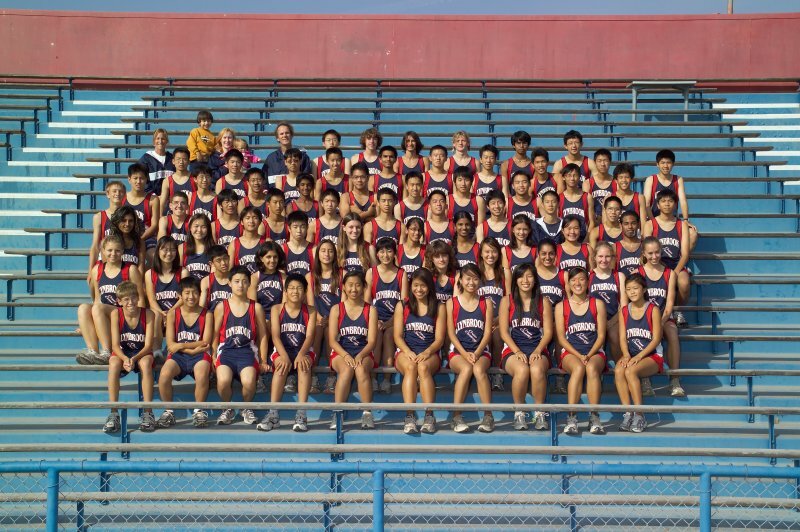 The "Hank Lawson XC Club" will meet on Mon & Wed at 5:30 at Lynbrook HS (by the pool) starting on June 19th to run anywhere from 3-7 miles..
2006 Track: Still looking for 2006 Track results (GWI, NON,...).